2451 Aircraft Control & Warning Unit was reformed, this time at Windsor, Ontario. The Squadron was reborn on 4 January 1954 and was designated as 2451 Aircraft Control & Warning Squadron (Auxiliary) Windsor. It should be noted that by this date, the term "Reserve" had long been replaced by Auxiliary. Unlike the majority of the other Auxiliary AC&W Units and Squadrons, 2451 AC&WU reported directly to the Air Officer Commanding Air Defence Command rather than going through a Reserve Group or other Command. 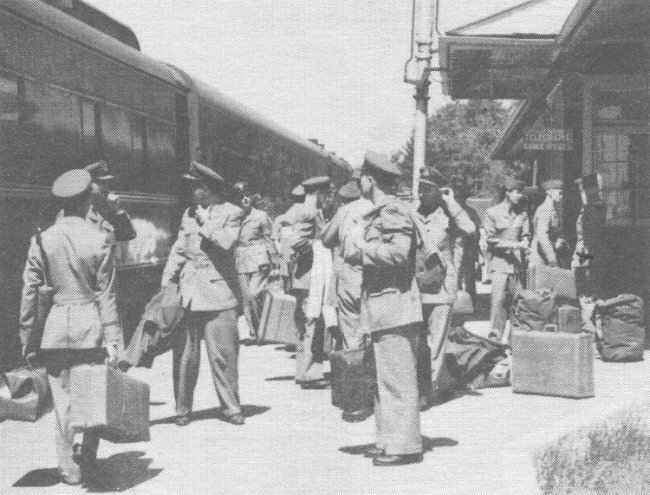 Logistics and other support was however, provided by RCAF Station London. 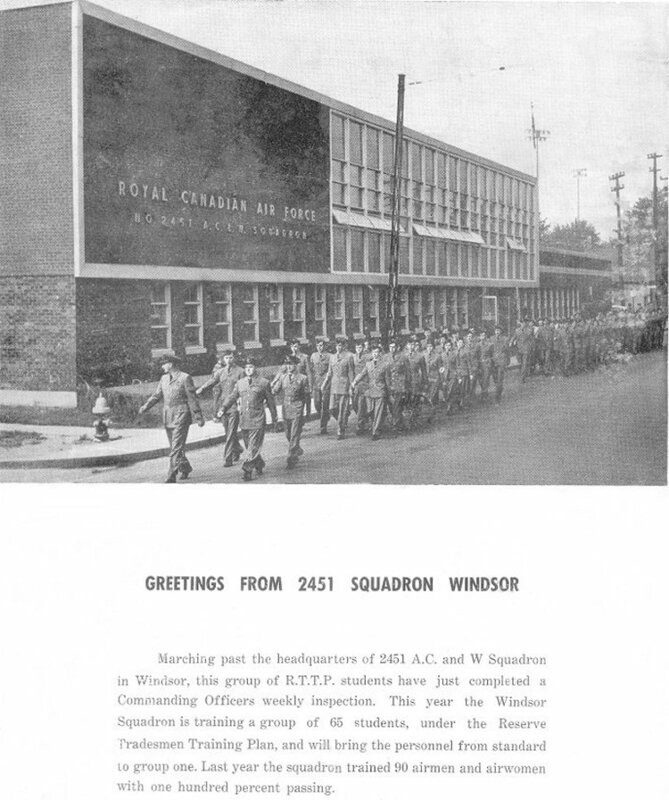 A small number of 2451 personnel received initial training as Fighter Control Operators at Mount Hope, Ontario - the home of 2424 AC&WU, Hamilton, Ontario - during the summer of 1956. 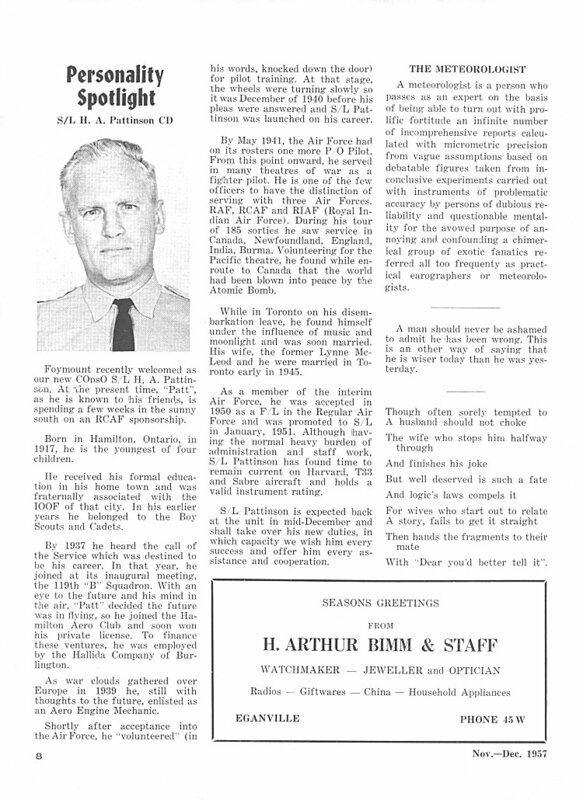 Narrative reports on the Pinetree Line web site confirm that 2451 AC&W Squadron was active at RCAF Station Foymount, ON during the years 1956 to 1959 inclusive. Evidence also verifies a deployment to RCAF Station Beaverbank NS in 1960 and RCAF Station Falconbridge in 1960. As was the case with all the other Auxiliary AC&W Squadrons, 2451 AC&WU was disbanded on 31 May 1961 due to the onset of SAGE. Brief Regarding Alternate Roles - 4 November 1960. Historical Narrative - 1 July 1959 to 31 December 1959. 2451 AC&W Squadron personnel marching past their headquarters building in Windsor, Ontario - June 1959. Historical Narrative - 1 December 1958 to 30 June 1959. The Royal New Zealand Air Force - March-April 1958. 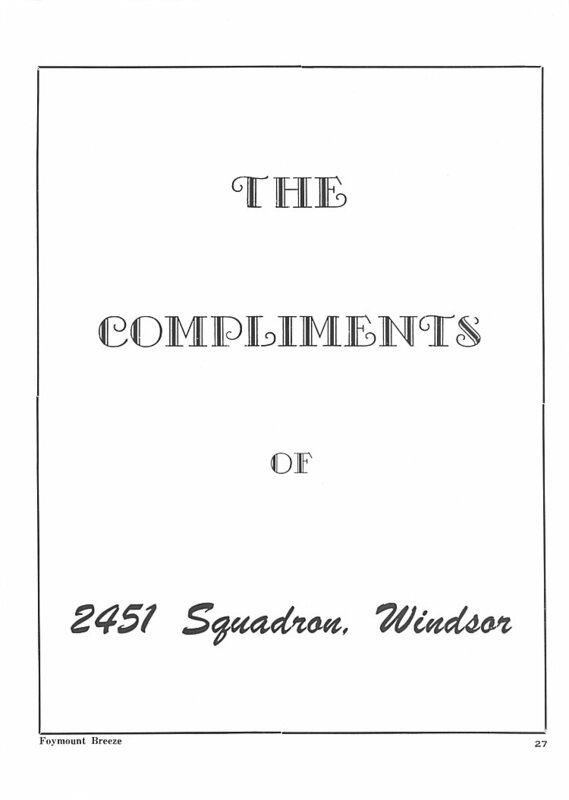 Compliments of 2451 AC&W Squadron - March-April 1958. 2451 AC&W Squadron - November-December 1957. 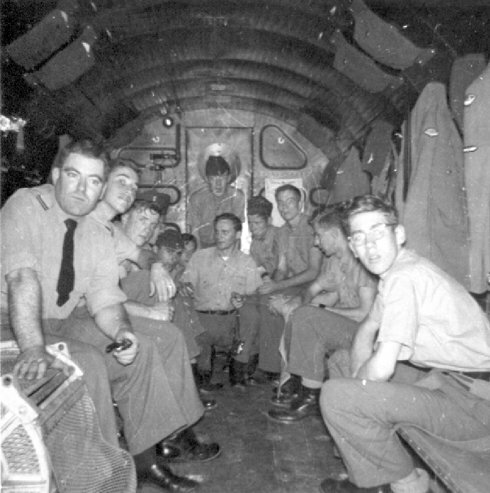 A group of officers from 2451 AC&W Squadron in a Dakota - November-December 1957. 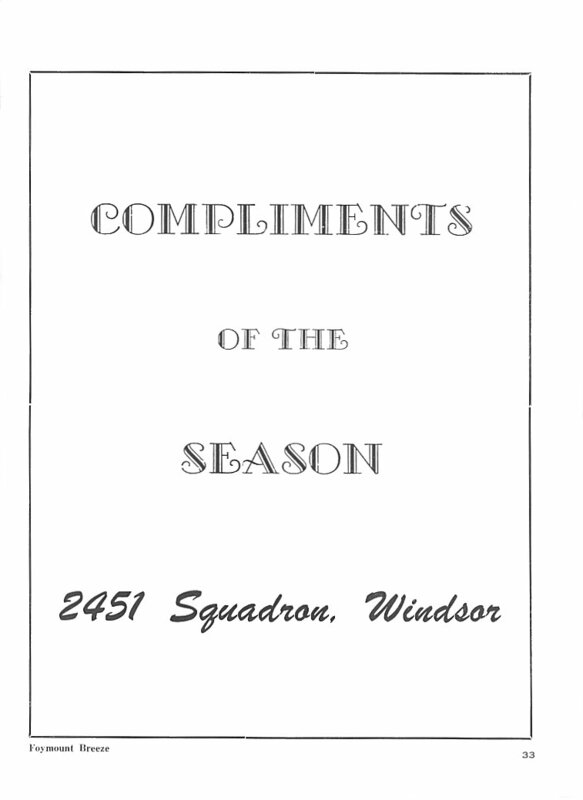 Compliments of the Season - November-December 1957. 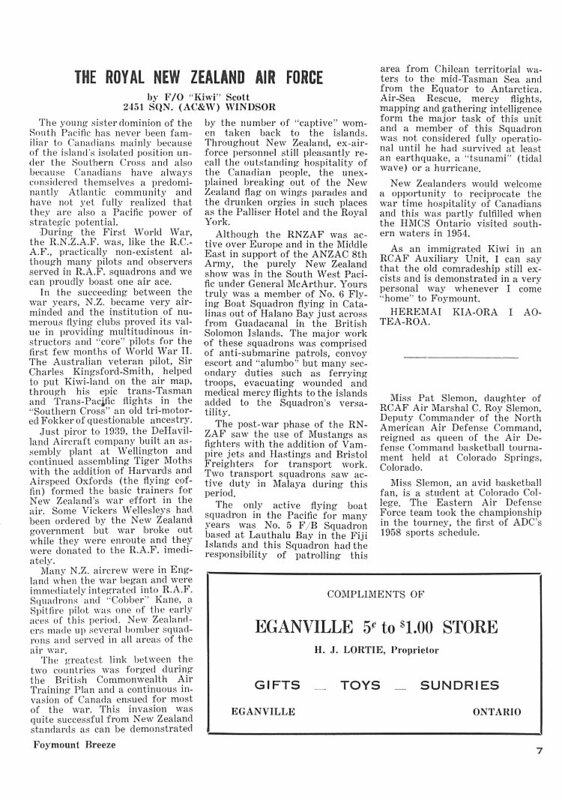 Letter re Official Opening of Headquarters - 15 October 1957. 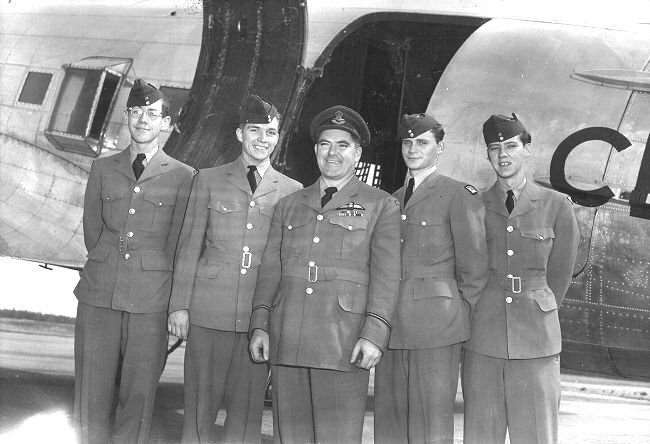 2451 AC&W Squadron personnel. Volunteers to assist in an air search for a missing aircraft. Taken in Val d'Or, Quebec - July 1957. 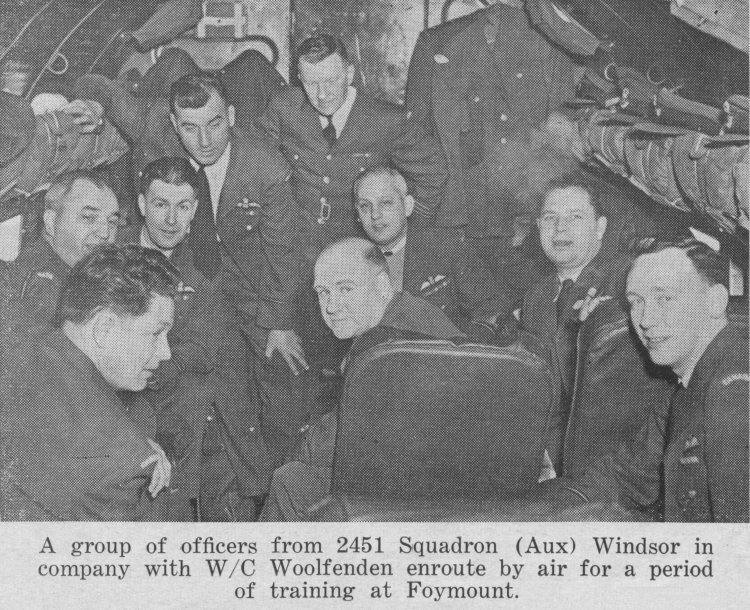 2451 and 2416 AC&W Squadron personnel. Volunteers to assist in an air search for a missing aircraft. Taken in Val d'Or, Quebec - July 1957. Ren L'Ecuyer (front row 1st left), Warman Barnard (back row 2nd from right). 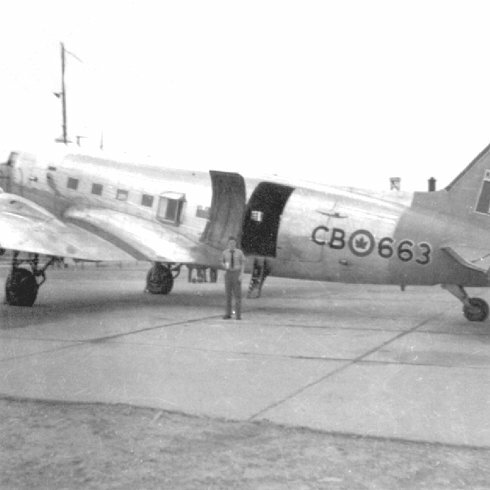 Ren L'Ecuyer beside C-47 Dakota preparing for departure to assist in an air search for a missing aircraft. Taken in Val d'Or, Quebec - July 1957. 2451 and 2416 AC&W Squadron personnel on board C-47 Dakota departing to assist in an air search for a missing aircraft. Taken in Val d'Or, Quebec - July 1957. 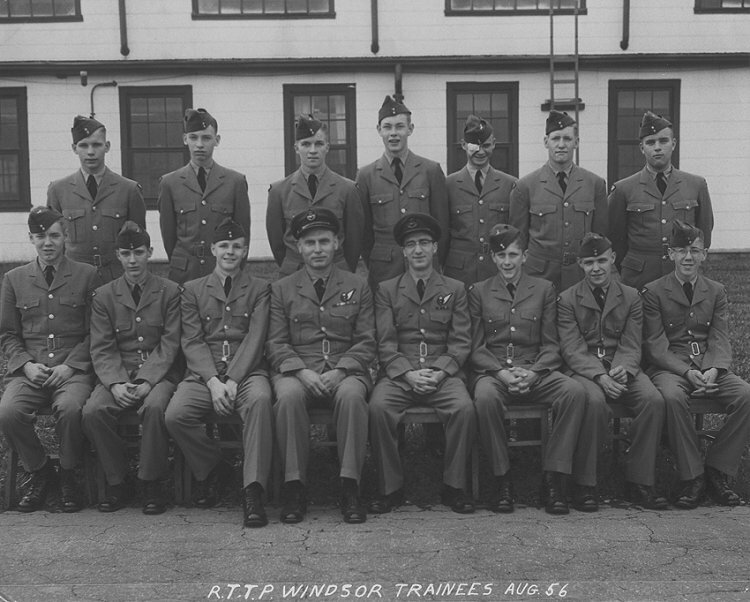 2451 AC&W Squadron trainees at CNR Station in Windsor prior to departing for Foymount - July 1957. 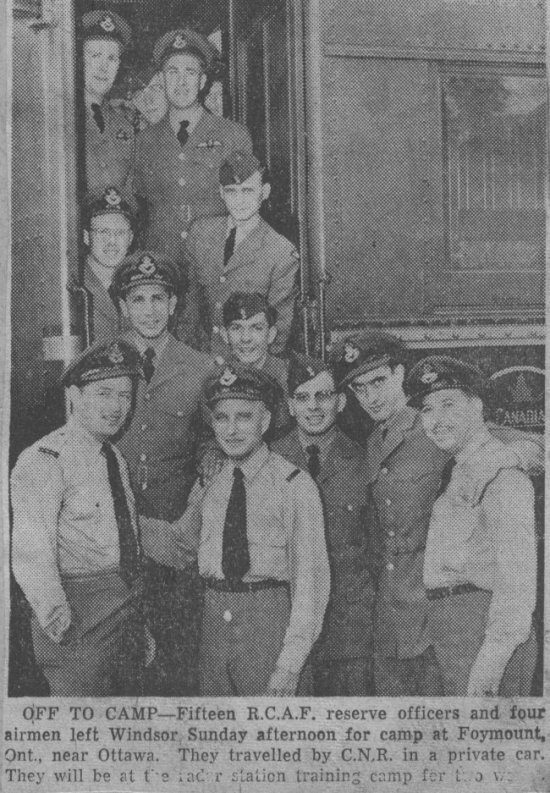 Newspaper photo of 2451 AC&W Squadron trainees at CNR Station in Windsor - July 1957. Ren L'Ecuyer, head showing between the two Officers at the top of the photo. 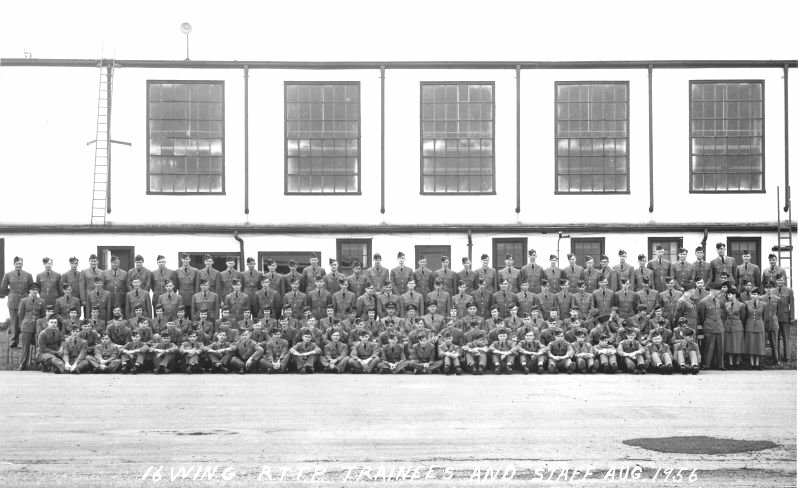 2451 AC&W Squadron trainees. Taken in Mount Hope, Ontario on completion of FtrCop Group 1 training course - August 1956. Back row (L-R) Murray Richer, Dennis "Denny" Dent, unknown, ? McLeod, unknown, unknown, unknown. Front row (L-R) - Unknown, unknown, ? McCallum, unknown, unknown, unknown, Walt McColl, Ren L'Ecuyer. Reserve trainees (Windsor included). Taken at Mount Hope, Ontario on completion of training course - August 1956. Ren L'Ecuyer, front row 12th from left. 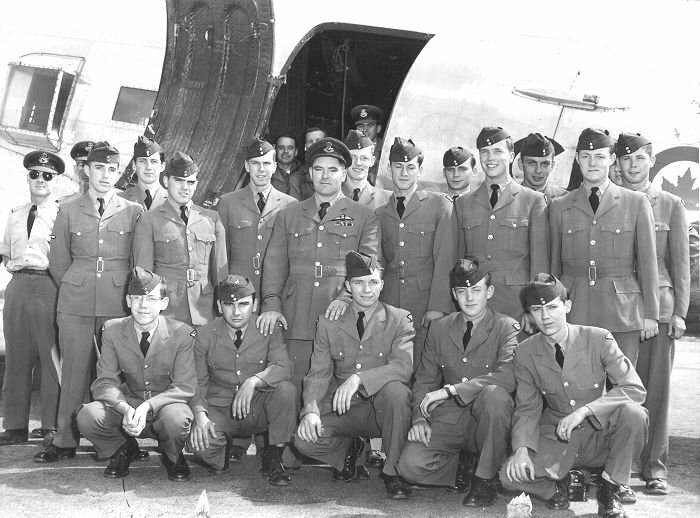 Close up photo of graduating Reserve trainees at Mount Hope, Ontario - August 1956. Amendment Lists to Organization Order R2.0.0.2 - 3 May 1955 to 15 October 1958. Organization Order R2.0.0.2 - 28 December 1954. Historical Narrative - 4 January 1954 to 30 November 1955. Organization Order 37/53 - 12 November 1953.